I'm so excited to be a part of the Paperie fabric blog hop along with so many other talented makers (To see the list, just visit the NanaCompany blog). Paperie is the first line of fabric from Amy Sinibaldi of NanaCompany and it's adorable! Perfect for just about anything, but I like to keep my projects short and simple, because that's about all I ever have time for! 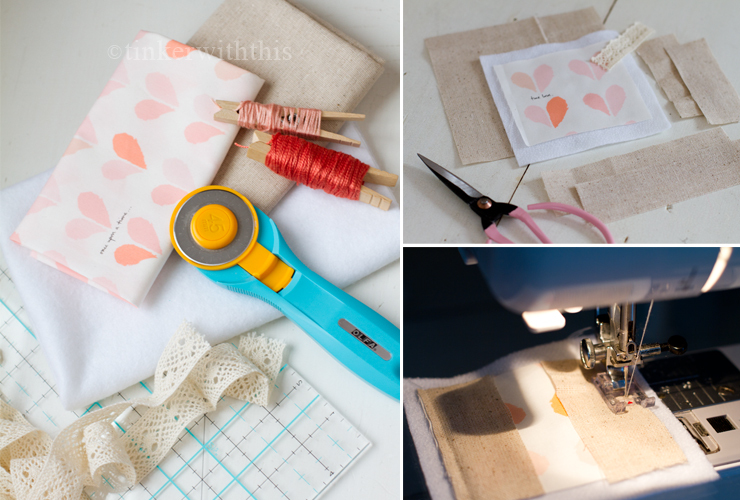 So, if you're making some of the other larger projects with your fabric bits and need something small to use up the leftovers, this is perfect. 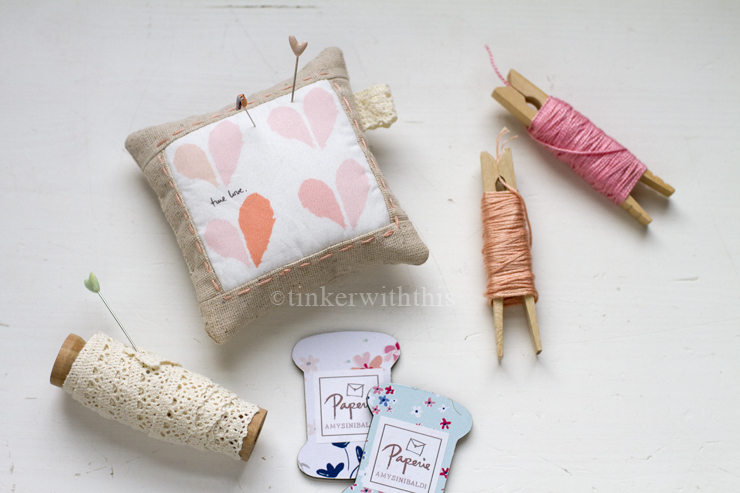 To make the linen embellished pincushion you'll just need a few supplies. Linen, iron-in stabilizer, your favorite Paperie print, some matching floss and a little ribbon or lace for embellishment. To get started, just center your middle fabric and machine stitch each side linen strip down to the stabilizer. After you give it a quick press, attach the top and bottom linen strips. At this point, you're ready to hand embellish your pincushion top. Once you're happy with your handy work (I did a simple running stitch around the center), you can put the right side of your front and back together, add your ribbon loop facing inside, pin and machine stitch closed following along your stabilizer as a guide. Don't forget to leave an opening on the top or side to allow for turning right side out and stuffing. Now that you've trimmed the excess, turned your pincushion right side out and given it a quick press with a hot iron, it's time to stuff it and hand sew the opening closed. I prefer to fill my small pincushions with crushes walnut shells which you can find online or at your local pet shop (as reptile bedding). There, you're done! 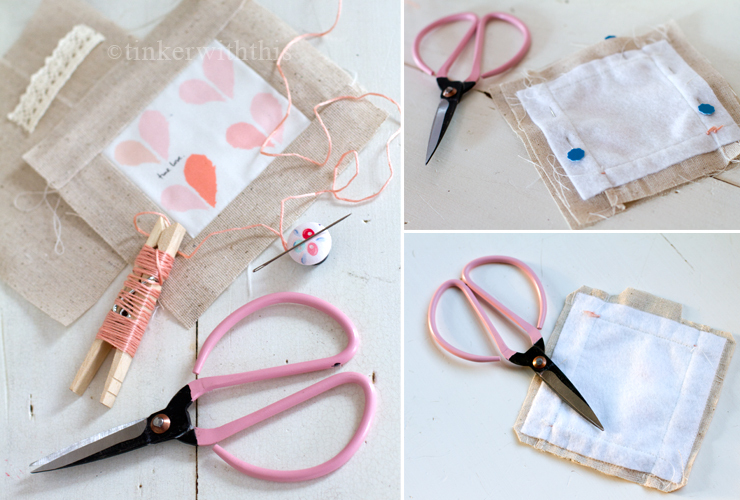 It's a very easy make, using equally adorable fabric. I hope you guys enjoy making this as much I did. Look for Amy's line Paperie from Art Gallery Fabrics. You won't be disappointed! This is adorable! Thanks for the great tutorial! So pretty - love it and a great idea. Thanks for sharing! Love it!! So pretty with clear instructions . Very cute pin cushion. Thank you for sharing the tutorial. This is soo soft and sweet. And thanks for your previous tip on IG about where to find crushed walnut shells a big help! Saving me some money because the packs at the quilt shop were $$$$. Cute little pincushion thanks for sharing with us! 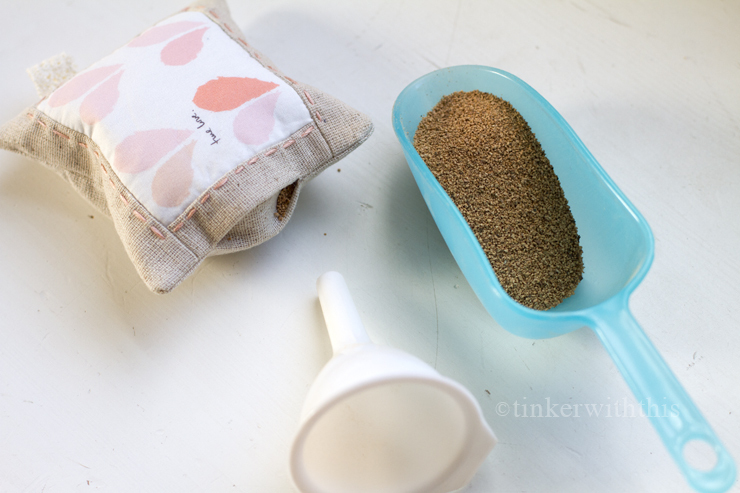 Love the pin cushion and I have never used walnut crushed shells. So sweet! Love the hand stitching. FYI...crushed walnut shells are the best value in the pet store. They are also used for small critter and bird cages. Oh this is super cute. I would whip one of these up for my dear sister. Thanks for this fun, cute tutorial. I also like to use crushed walnut shells. 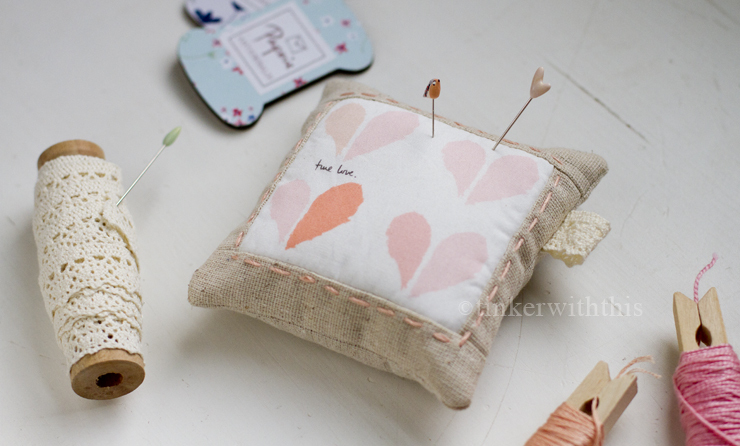 Your pincushion is so cute. Thanks for the how tos. I over your Pinnie!!! I need to get some rushes walnuts but will have to look in the city, there's nothing like that on my small town!! Cute and fast project ! Love all the words in the fabric. Just found your blog. Enjoying it. Love this project, and your work is so very pretty! Also loved the little tags you made on your last post! Thanks for sharing! Love your pincushion sewww much that I followed your awesome tutorial and made one! I Love it!!! Very sweet little pin cushion! Fabric is perfect for Valentine's Day! Love your projects using Amy's new fabric line. The hand stitching and little lace ribbon add such a nice touch. Love this little pincushion. I love to have many small pincushions around and about. I have also used crushed corn cobs as a pincushion filling. It is an option for those with a severe nut alergy. They are sold in gun and hardware stores (and Amazon) as a brass polishing medium.